The Coach House Trust provides occupational, educational and employment opportunities for adults recovering from addiction. 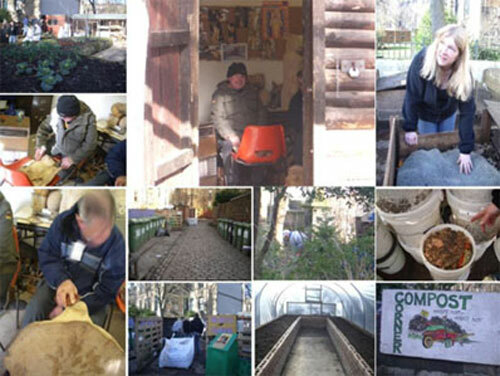 Trainees learn new environmental work skills through recycling materials, composting and landscaping. The coach house trust seeks to challenge the economical and social exclusion of adults who are recovering from problems associated with mental health addiction and learning difficulties. These people find it difficult to find and keep a job, it happens that the coach house gives them focus and oportunities to gain skills, and be part of a warm community environment. They provide personal, social and vocational development opportunities to their clients in settings which regenerate them to the mainstream community. They achieve this through providing indoor and outdoor workshops and activities such as Ceramics, Woodwork, gardening, and recycling compost. The people work in and with the local community so that mutual trust and respect is built and integration is achieved. The trust bought a derelict building and have renovated it to become a centre which promotes innovative approaches to education training and employent for the client group.The Glasgow city council allowas the Trust to landscape public areas. They started with the Triangle garden which used to be a public victorian drying green. People come to the project through an open referal system and must bring some funding with them from local health boards. The trust now has a 100 clients involved and about 20-30 of those arent regulars and there is no time limit. They’ve now reached a maximum capacity of people since they do not wish to become a major organisation in fear of becoming too crippled by bureaucracy. They rely on many sources of funding but with little profit in the end and their annual turnover is 1 million pounds. People who have experienced addiction or mental illness are regularly ignored in everyday society. They find they can be understood and welcomed in the Coach House which gives many opportunities to learn new skills, meet new and similar people and help society in the training and participation of sustainable practices; woodwork, mosaic, metalwork, slab-making, furniture-making, gardening and horticulture, and recycling. Much of this work benefits the neighbouring society. The team works in public spaces, renovating them to create new zones in which to enjoy. Locals have their gardens landscaped by the Coach House, helping the income of the Trust. Much of the crafts work is also sold in their shop or through exhibitions in Glasgow. The Coach House Trust has many advantages being both in the city and very close to a river and park/woodland areas. The spaces which are on loan by Glasgow City Council mean that much work can be done on renovating and creating pleasant spaces which are used by the public. Gardening and Horticultural practices are learnt by the “clients” and also neighbouring primary and secondary school children. Fruit and vegetables are sold to the public in markets and restaurants. The education of sustainable solutions is vital in todays society as the environment is increasingly threatened and the Coach House Trust highlights this through their practice. The Coach House Trust is a non-profit organisation which is funded by various bodies; health board, charities etc. The “clients” which regularly attend must have funding to be able to be part of the coach house and this money goes towards training, materials and equipment and staff. Although the Trust does not want to expand in danger of tipping the balance, it would be hard to source enough funding to do so. This means that new clients are increasingly unable to join or participate. Any work sold through the shop or restaurants/markets goes towards materials/tools etc.